Roger’s House is a cool, young and vivid Hostel in the Center of Tel Aviv. Are you ready to sleep in Tel Avivian vintage style? Stay convenient, stay cozy, stay Tel Avivian in the Center of Tel Aviv! Roger’s House Tel Aviv designed for travelers like you, curious, social explorer, looking for memorable, shareable experiences. We offer plenty of common spaces: front yard, back yard, A big and fully equipped Kitchen, Lounge. ping pong table and 24/7 Reception. When you’re done exploring, enjoy a drink or a snack at our bar; our own craft ale beer - Birra Roger, hipster cocktails, organic wines, and unique coffee creations in our bar. Its relaxed vibe makes it a cool place to meet new friends. We are situated in the most exclusive neighborhood of Tel Aviv – Neve Tzedek and located in an historical and authentic building from 1929. The location is ideal, in the beautiful and quiet neighborhood of Neve Tzedek one of the first neighborhoods outside of Jaffa. Its beautifully restored houses and streets preserve the romance of the late 19th century. A walking tour of Neve Tzedek is a must for romantics, history lovers and fans of small, winding alleys. The famous Beaches of Tel Aviv are just around the corner- 10 min walk. Tel Aviv boasts a stunning promenade which runs alongside the seashore of the Mediterranean Sea. For some exciting nightlife you can visit the Rothschild Blvd, which is 7 min walk. If you want to see Old Jaffa (Yafo) it’s just a 12 min walk. The Carmel Market ('Shuk HaCarmel') is the city's biggest marketplace and a fascinating place to visit and taste the freshness of Local produce –18 min walk. If you’re looking for luxury lodging at a convenient price, book your unique travel experience today. We can’t wait to meet you! This low cost and trendy design Hostel in Tel Aviv with its self-catering accommodation, offers great value Hostel rooms and great rates. Stay in one of our comfortable dorms which we offer in various sizes. These dorms are available in mixed, men and women categories and offer great value accommodation. Our dorm rooms are for adults over the age of 18 only. You can rent from us bikes, longboards and surfboards for daily use with cashing in a deposit. We also offer free WiFi, free coffee & tee as well as free lockers (use your own lock or buy one here). Taxes included (For Non Israel Citizens Only). Dorm Rooms 18 – 45 years only. Private Rooms: 18-120 years . Pretty building, clean showers, excellent people, and comfy beds. Definitely the place to stay at in Tel Aviv. Perfect location and in walking distance from everything, really cool building and an amazing kitchen with everything you need and more, each bed had a plug and a little lamp, super friendly staff and they even have their own craft beer. There was something happening every night and its really easy to meet other travelers. Will definitely come back! Lovely hostel, I slept surprisingly well in the 30 bed dorm room (the free ear plugs helped!). Shabbat dinner was delicious and fun. Good atmosphere. The best place you can find in Tel Aviv, especially for solo travelers - the atmosphere is amazing, the building itself has a character, and it's perfectly located for exploring the city - young hip Florentin on one side, beautiful and peaceful Neve Tzedek on the other. Even on a rainy day you don't feel like you miss out on the fun - all the fun is happening inside, thanks to the team of volunteers&staff, it feels like home (but better, cause you get to meet some great people). What a fun hostel! The staff made our trip so much fun, the whole hostel had a great atmosphere. Multiple common rooms, events every night and a cleaner came through every day. We had a problem with a guest in our room and the staff dealt with it efficiently and discretely - greatly appreciated. Thanks Rogers! Make sure you try the beer! 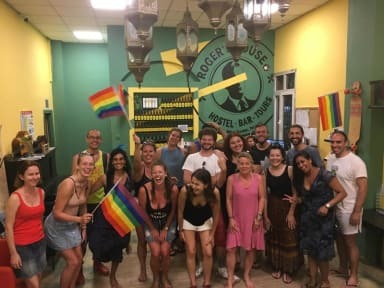 The atmosphere in the hostel is very connected, the people to eachother; it is amazing, the vibe of the hostel creates the space for opportunities to make connections with people, it is very open, and free, and beautiful. I loved my time at Roger's. All the staff and other guests were interesting and friendly. Very exciting and welcoming crowd, great place to go if you're interested in meeting other travelers. Rooms were good with everything provided including a locker per bed in my room. Bring your own lock if you can. Bathrooms were as expected in a hostel. Had shabbat meal with some staff and other guests and it was a very good meal and good time. The bar crawl was also a good time but a little expensive.